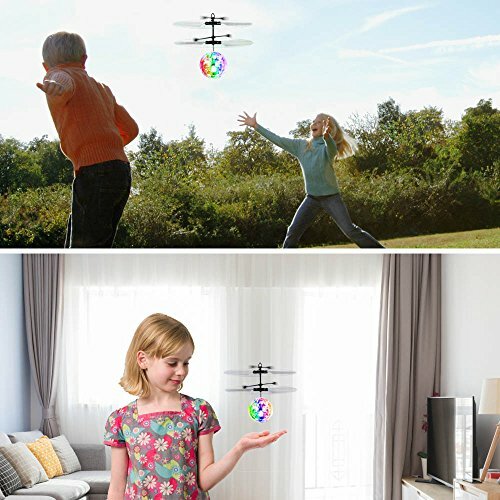 SAFE AND FUN FLYING TOYS: Advanced LED infrared sensor technology,inductive suspension and collision protection. 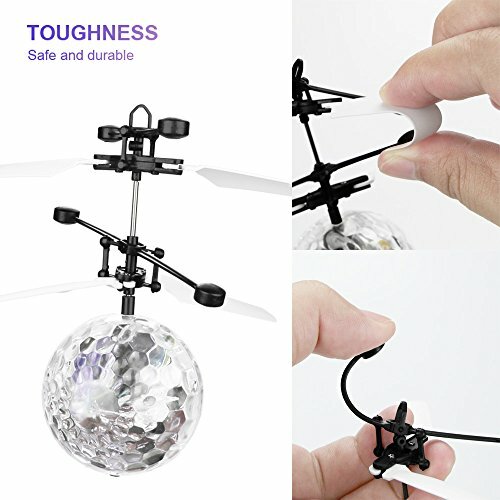 The built-in gyroscope can control accuracy and sensitivity to make balance. You can put your hand underneath to control it in the air for interactive play. 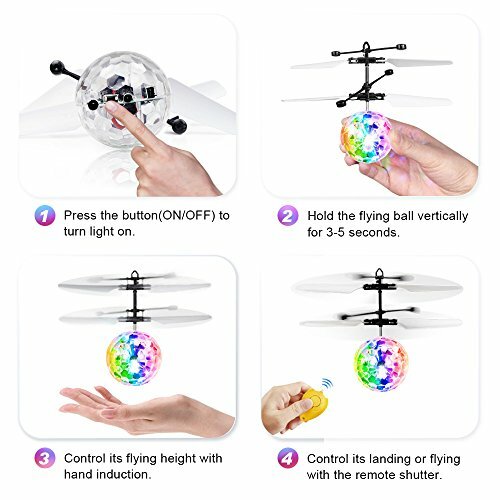 And control its landing or flying with the remote controller. Light weight,easy to fly with simple operation,especially designed for beginner. MULTIPLE PROTECTIONS RC TOYS: 1. 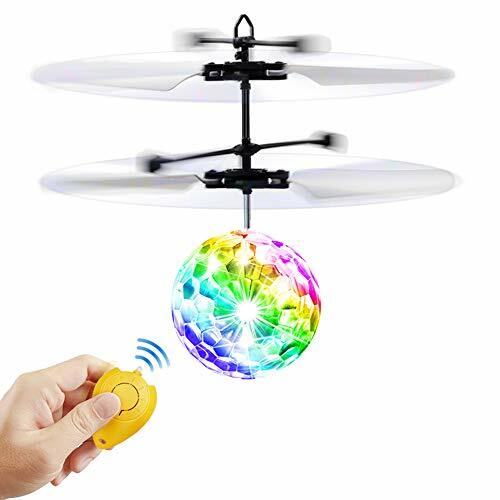 Flying protection: The ball will automatically sense the objects underneath and fly away when you switch on;2. 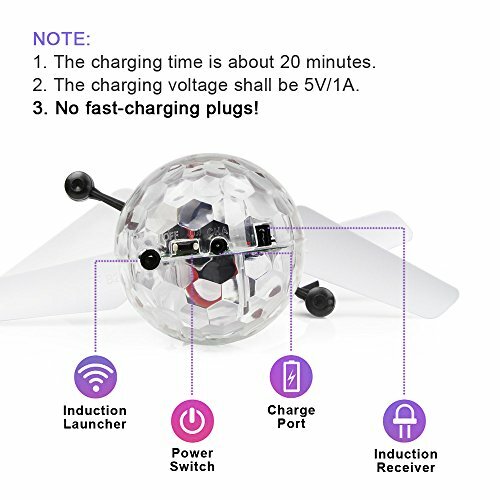 Power-on protection: The flying ball will be stationary for 3 seconds to ensure safety when you turn on the switch;3. Collision protection: When the Flying ball falls down to ground or collides with other objects, it will stop whirling;4. Environmental protection: non-toxic ABS material;5. Automatic power off protection when charging finishes. RECHARGEABLE LED LIGHT BALL: Flashing LED light plus a glass ball appearance design which will emit bright shining and colorful light when it is on. It has great visual appeal for any children and adults. You only need to connect it on a USB connector for 20-25 minutes. 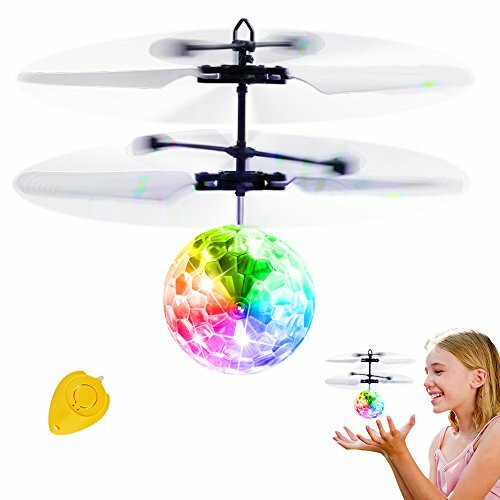 Fantastic LED RC flying helicopter ball! 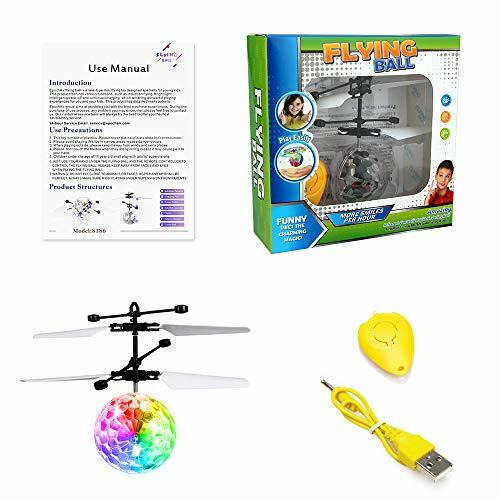 ENVIRONMENT FRIENDLY AND DURABLE TOYS FOR BOYS&GIRLS: Flying balls are made of environmentally friendly non-toxic ABS material, safe enough to your kids as well as the environment. The wings are not easy to break or to be easily deformed. Very sturdy and will resist damage when it falls. And the ball drone will move away intelligently when it detects a solid object. Reduce the damage. 100% SATISFACTION GUARANTEE: We strongly stands behind each item it designs and sells. Each product is backed with a three-month warranty and 100% Satisfaction Guarantee.